The first increase in US interest rates in almost 10 years is not expected to result in a large-scale crisis in emerging markets, but there are still risks. The hike also comes at a time when emerging markets are struggling with the slowdown in China, low commodity prices and increasing geopolitical risks. The risk of a sudden shift in market sentiment is therefore present. International investors may pull capital from these markets leading to high interest rates. The most vulnerable countries are Turkey, Indonesia, South Africa and Malaysia. They have high external borrowing requirements and relatively low buffers. Additionally, heavily indebted corporates that are commodity dependent or operating in a shrinking economy might be vulnerable as well. As the world gears up for the first US rate hike in nearly 10 years, there is a lot of turmoil in the financial markets. This primarily affects emerging economies, as previous rate hikes by the US central bank were often associated with crises in emerging market economies. This time around, the rate hike is communicated extensively and the emerging markets in general are better equipped to withstand an interest rate hike. Large-scale crises such as those in the 1980s or 1990s are therefore not expected now. But the US interest rate hike will probably further affect economic growth in emerging countries and thus creditworthiness. Emerging markets are already under pressure from slowing growth in China, falling exports, lower commodity prices and depreciating currencies. Concerns about the creditworthiness of companies in emerging markets especially is a rising concern because they have borrowed heavily over the past decade. Increasing business failures are therefore to be expected. Even though a large-scale crisis is not expected, markets will remain unsettled due to uncertainty about the pace and scope of the normalisation of US monetary policy and the strength of the US economy. Most vulnerable are countries with high external financing needs, high foreign currency debt, a questionable monetary policy and external low buffers. Below, we examine which countries are particularly vulnerable and why. The rate hike is part of a process of normalisation of US monetary policy after it was loosened to dampen the effects of the financial crisis that began in 2007 in the US housing market. The US central bank (the Fed) then lowered interest rates to eventually 0-0.25% in December 2008. It has also bought bonds and other securities on a large scale (so-called quantitative easing). With the strengthening of the US economy the need of such ultra-loose monetary policy declined. The Fed gradually bought fewer bonds ("tapering") and stopped this programme altogether in October 2014. Earlier that year, the Fed also began to prepare the world for a raise in interest rates, which will make this the best communicated rate hike ever. It is also one of the longest-prepared and most transparent. To manage the expectations of the market as well as possible, the Fed already in June 2011 announced the conditions for normalisation. The pace and the extent of normalisation would depend on the strength of the US economy, particularly employment and inflation (expectations). Good communication, however, does not guarantee a smooth normalisation process as became clear during the so-called "taper turbulence" of 2013. This was a period of great exchange rate volatility caused by the announcement that the Fed would gradually buy less securities and which affected emerging markets in particular. The "taper turbulence" reminded the world of the importance of US monetary policy for global investor sentiment and thus for capital flows to emerging markets and their interest and exchange rates. This period also provided insight into the impact of normalising ultra-loose US monetary policy for the emerging markets. The ultra-loose US monetary policy that started in 2008 drove capital flows into emerging markets by investors looking for yield. This resulted in upward pressure on emerging countries’ currencies, rising equity and bond prices and falling interest rates. Lower interest rates, both external and domestic, in turn boosted borrowing and economic growth. This time around, it was mainly companies in emerging markets, particularly in the energy and construction sectors, that have increased their borrowing in this period of cheap money. Most borrowing has been domestically in local currency, but also from foreign banks, and increasingly from the international capital market. The champion of corporate borrowing is China, where corporate debt increased rapidly to a high level at 180% of GDP in 2015, the fourth highest in the world. But in China, corporate debt is mainly financed domestically in local currency. This makes China less vulnerable to a change in market sentiment. However, both the level of corporate debt and the rapid pace at which it is growing increases the likelihood that the debt will hinder economic growth. More vulnerable to a change in market sentiment is foreign currency debt and/or debt funded externally by non-residents. Bond financing in particular is sensitive, because bonds are tradable, unlike bank loans. Companies in Brazil and Mexico, in particular, increasingly used this type of financing. In these countries, corporate external debt compared to export revenues is relatively high as well. The same applies to India, Indonesia, Russia and Turkey (also see Atradius Economic Outlook – November 2015). Market sentiment changed during the "taper turbulence" when markets suddenly realised that the period of ultra-loose US monetary policy would be finite. Capital flows shifted, but now in the direction of the United States and away from emerging markets: resulting in downward pressure on currency, falling share and bond prices and higher domestic interest rates in emerging economies (also see Vulnerable Emerging markets – Atradius Economic Research Note, October 2014). A similar effect occurred following the mid-2014 announcement by the Fed that US interest rates would be normalised. Such a process of capital outflows makes financing of foreign debt more difficult and more expensive, the latter due to depreciation and higher interest rates. Therefore it leads to a decline in creditworthiness of borrowers in emerging countries. Particularly disruptive are “sudden stops” in capital flows, which in the past have often been associated with US interest rate hikes. As a result of such sudden stops, rate hikes have often been accompanied by a balance of payments crisis: a financial crisis or default by the government in emerging economies. Thus, the Fed has improved its communication strategy as mentioned above. And the emerging markets have improved their macroeconomic policies, have moved from fixed to flexible exchange rate systems, have built up their reserves, and have improved their debt structure by extending maturities and borrowing less abroad. 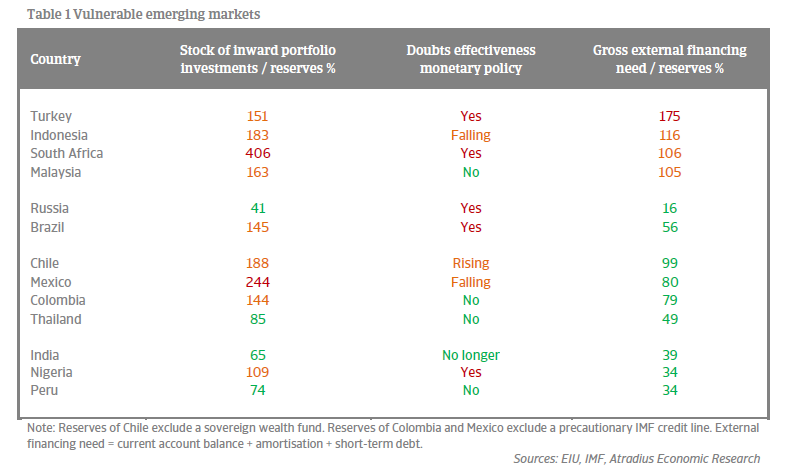 As a result, the emerging countries as a whole are now better equipped to withstand a Fed lift-off. They can use official reserves and the exchange rate as a shock absorber. The adjustment process is already in full swing and began with the "taper turbulence" in 2013, long before the lift-off itself. Since then the currencies of the emerging markets have been on a depreciating trend (see the chart). This depreciation was not only due to the normalisation of US interest rate policy. Other forces have also contributed to shifts in market sentiment, such as falling commodity prices and rising concerns about growth in China. Generally speaking, countries that have a high stock of inward foreign portfolio investments (shares and bonds) and/or where doubts about the effectiveness of monetary policy are rising are particularly sensitive to shifts in market sentiment and thus to capital outflows. The table shows that this is especially true of Brazil, Indonesia, Turkey and South Africa, as well as of commodity producers Chile, Colombia, Nigeria and Russia (Russia has also suffered from sanctions). Their currencies showed above average depreciations against the US dollar (more than euro) since 2013. The Mexican peso is generally vulnerable due to a high stock of inward portfolio investments into Mexico. In most of these countries, the exchange rate can indeed act as shock absorber. The extent to which much depends on the gross external financing need resulting from the current account and the repayment of foreign debt. The higher this external financing requirement, the more negative the impact of depreciation on the creditworthiness of debtors in the country in general and the more vulnerable the country will be to a shift in capital flows associated with a normalisation of US monetary policy. The table shows that the external financing in Turkey is particularly high. To a much lesser extent this is also the case in Indonesia, Malaysia and South Africa. In all of these countries, the external financing requirement exceeds the level of official reserves. Therefore, these countries are less able to deal with the impact of the normalisation of US monetary policy on external financing: making it more difficult and more expensive. Companies that have borrowed externally and in foreign currency without sufficient hedging and whose earnings are under pressure due to a shrinking economy and/or due to low commodity prices – Brazil and Russia – are very vulnerable as well. The general expectation is that the Fed lift-off itself will have a moderate negative impact on capital flows to emerging markets and therefore on the creditworthiness of their debtors. After all, this lift-off will not come as a shock, as it has been extensively communicated and has been long anticipated by the markets as a result of which the adjustment process is already in full swing and according to many analysts largely completed. Also, based on the Fed's communication, markets generally expect that rates will be raised gradually and in small steps and will be accompanied by a strengthening of the US economy. Large-scale crises such as in the 1980s and 1990s are therefore not expected. But economic growth in emerging markets is expected to slow down further. In countries that trade more with the United States, such as Mexico and those in Central America, the negative impact will be partially offset by an increase in their exports. However, risks are mainly to the downside: managing market expectations is a daunting task as the period of "taper turmoil" shows, there is uncertainty about the strength of the US economy and the rate increase comes at a time when the economic environment is already challenging for emerging markets due to the slowdown in China, declining world trade, low commodity prices and increasing geopolitical risks. The risk of a sudden shift in market sentiment is therefore present. The most vulnerable are (companies in) countries with high external borrowing requirements and relatively small buffers. This applies particularly to Turkey and to a lesser extent, Indonesia, South Africa and Malaysia. Additionally, heavily indebted companies that are commodity dependent or operating in a shrinking economy might be vulnerable as well.